Nazca Lines (Nasca Lines). Maria Reiche. HTML5 Animation for iPad and Nexus. Geoglyphs, Southern Peru, Land of the Incas. Above, our last trip to Nazca, Peru: seeing the trapezoids from a Cessna, Friday, March 25, 2005, 9 AM. In the background the green valley of the Nazca-river. Ursula and Tim are my daughter and son-in-law. The Nazca Lines (Nasca Lines), are a set of zoomorphic, phytomorphic and geometric figures (lines, triangles, trapezoids, circles, spirals, birds, a spider, a monkey, flowers) that appear engraved in the surface of the Nazca desert, a high arid plateau that stretches 37 miles between the towns of Nazca and Palpa on a large flat area of southern Peru). The Nazca Lines are one of the mysteries of the ancient world. 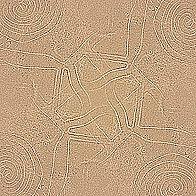 They are the most outstanding group of geoglyphs (drawings on the ground) in the world. Lines and figures appear in an area of over 300 square miles. How did the ancient people of the Nazca desert (between 900 BC and 600 AD) achieve such geometrical precision, and what is the meaning of the drawings of giant spiders and birds? Decades of exploration and study by German-born mathematician Maria Reiche led her to see the Nazca lines as a sophisticated astronomical observatory, created to mark risings and settings of the sun, moon and stars. "If you fly high above Peru's parched southern coast, you'll see one of the world's enduring mysteries, the Nazca lines: geometric shapes and renderings of animals and plants, some of them miles long, scratched into the surface of the desert. How did their ancient creators draft these gigantic patterns with such precision? According to one theory, their shamans drank a liquid that took them on soaring psychedelic journeys whose visions were later traced in lines on the ground. Today, as you hover above them, you come to a singular realization: in Peru, magic realism is more than a literary genre, it's embedded in the landscape." The New York Times, Sunday Book Review July 16, 2006. 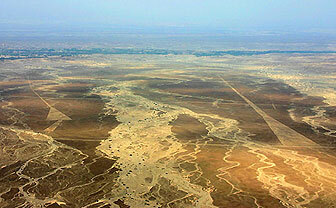 The Nazca Lines is one of the Top 10 Places of Mystery according to Travel Channel, Travel Ideas, Haunted Travel.